Hiroshima is a beautiful city with cute trams cruising along its tree-lined streets. From Nov. 12-14, this City of Peace — as it was proclaimed by the Diet (Japan’s parliament) in 1949 — hosted the 11th World Summit of Nobel Peace Laureates. Held during the 65th anniversary year of the U.S. atomic bombings of Hiroshima and Nagasaki, the summit’s objective was to help create a world without nuclear weapons, and the holders of 18 Nobel Peace Prizes convened there to draw a roadmap for peace. Frederik W. de Klerk, the last State President of apartheid-era South Africa (1989-94) recommended that summit attendees identify why people feel they need nuclear weapons. “If one is to approach denuclearization from a pragmatic point of view, one must remove the fears and the threats, which are used as an excuse for having the bombs,” said De Klerk, whose work to end apartheid led to him being awarded the Nobel Peace Prize jointly with Nelson Mandela in 1993. The atmosphere of the summit was that of a wonderful school camp. We were with our favorite teachers and all of us were learning a lot. The tone was set by His Holiness the 14th Dalai Lama, 1989’s Nobel peace laureate, who advised that people need to utilize every day in a positive way. “We need the concept of ‘we.’ The whole world is part of ‘we,’ “ he said. We got it: From early morning till late at night, delegates and other attendees alike were together in different formations. In one session, about 700 of us sat with the Nobel laureates. “We are in Hiroshima discussing the absolute necessity for the world to move toward the dismantling of all nuclear- weapons capability,” De Klerk declared. “Those who have it legitimately in terms of the NPT (Nuclear Non-Proliferation Treaty) and those who have it illegitimately alike, need to do it,” he explained to clapping and cheers from the audience. De Klerk shared his own experience with denuclearization in South Africa. He assured the audience that nuclear disarmament has economic advantages. Then, with all those present mindful of how Liu Xiaobo, this year’s Nobel peace laureate, is still jailed as a political prisoner in his homeland, de Klerk was asked how nations should approach China. “I think the economic might of China has the effect that countries are making allowances for China which they don’t make for other countries that don’t have the same economic power,” he noted. “There are double standards being applied by the leading countries of the world. In one instance they vehemently and strongly insist on human rights and democratization before they do business with a country; they stand away from certain countries. But in the case of China, all is forgiven. 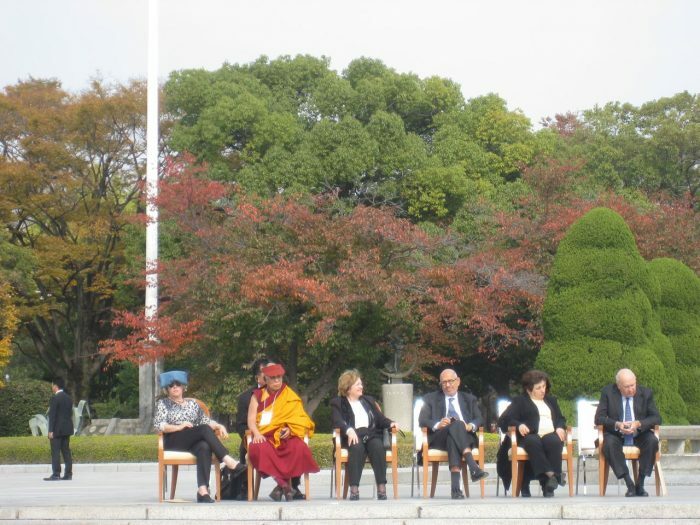 On Sunday, Nov. 14, we hopped on buses bound for Hiroshima Peace Memorial Park. Rain was expected. Northern Irish peace activist Mairead Corrigan-Maguire, corecipient of the 1976 Nobel Peace Prize, reminded all those present that although talk was indeed important, action was even more so. The crowd responded enthusiastically to her words. Egypt’s Mohamed ElBaradei, who was director general of the International Atomic Agency (IAEA) from 1997-2009, stressed the importance of educating the public. The audience applauded vigorously and the clouds began separating as if 2005’s joint Nobel Prize winner (along with the IAEA) had some special kind of power. 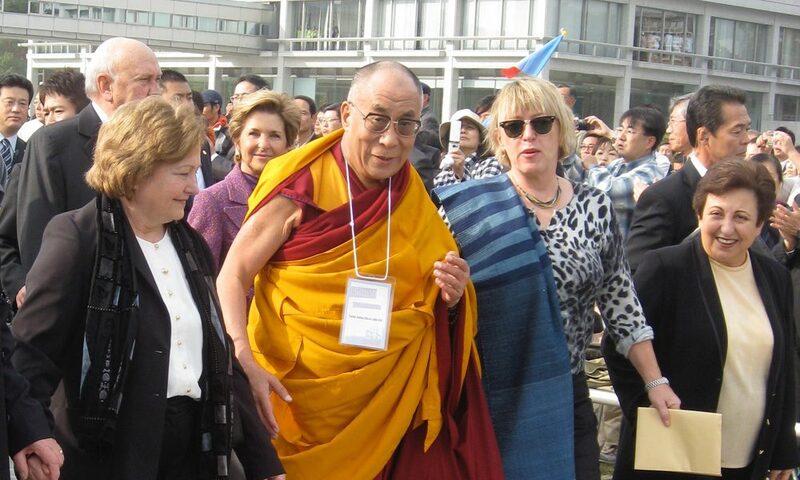 Then came Jody Williams, one of the leaders of the international campaign to ban landmines, who reiterated the Dalai Lama’s message that the world belongs to people, not to governments. “The Nobel Peace Laureates here are willing to work with you together. Please, let’s work together,” she entreated the audience of about 7,000. That passionate appeal by Williams — who, jointly with the International Campaign to Ban Landmines she worked for, was awarded the 1997 Nobel Peace Prize — was rewarded with powerful applause. 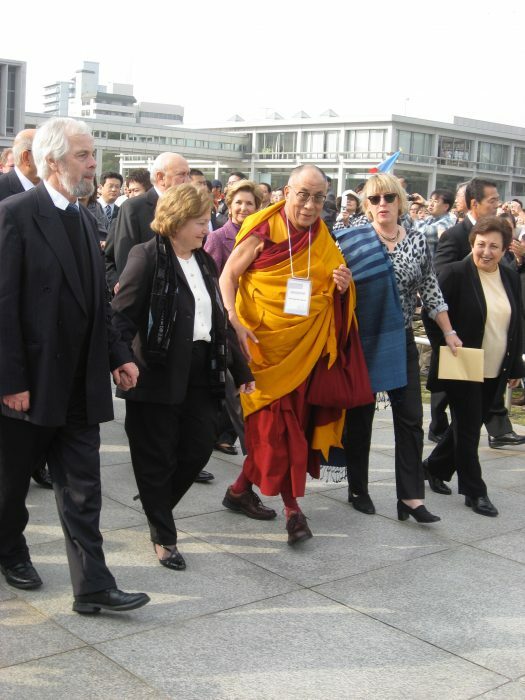 Iran’s Ebadi then spoke, saying: “Each time I visit Hiroshima, I carry two opposing feelings, one of deep sadness that weighs on me for the suffering you endured, and yet I can not help but to admire the greatness of your spirit in forgiveness. Amid wild cheers and clapping, flocks of little birds began chirping as the Dalai Lama then appealed to leaders from various religious traditions, business and government, to meet as soon as possible and take on a more active role in working for a worldwide ban on nuclear weapons. He also called on scientists to unite and speak out for disarmament, pointing out that nuclear arms don’t bring one side victory and one side defeat — but they lead to mutual destruction. The audience continued clapping as the Dalai Lama and Williams then presented a special award to Sunao Tsuboi, a leading member of the Japan Confederation of Atomic and Hydrogen Bomb Sufferers Organizations. “Till our last breath we never give up,” 85-year-old Tsuboi said with a chuckle. Meanwhile, about 100 Chinese people were demonstrating across the street. Ebadi and Williams walked over to them. But all the protesters did was leave, prompting Williams to inquire, “We are all people, we don’t represent governments — so then why did they run away? We are peaceful. There are no Japanese police here. The protesters left because they don’t want a conversation. But the only way is through dialogue. We all smiled, took the bus back to the hotel, and continued our discussions — as, hopefully, they will continue across an ever-broadening base until the goal of world peace is attained.